Showing results for tags 'remake'. What other Disney film should get a live action/CGI remake? Which game deserves a remake/remaster before the end of this generation? You know the drill folks. Gimme all your hopes and prayers for whichever remaster you would like! What Square Enix game(s) needs to be rereleased? Which aspect of the Spyro remake are you the most excited about? What's the most exciting casting choice for the Lion King remake? What type of Kingdom Hearts easter egg should be in Final Fantasy 7 Remake? What other classic(s) do you want to be remade/remastered next? Which other Disney movie should get a live action remake? Boku no Pi--- Uh, yeah. Welcome to the official Re: Pokémon: Region of Darkness RP thread! For those of you who are interested in joining but have not signed up yet, visit the Sign Ups. Locations and Map Traverse City (Green Square) The main hub city of Team Valor Susista City (Pink Square) A city that holds a lot of battle competitions Pyro Town (Grey Dot) A small town that is known for mining coal and other minerals Ernesto City (White Square) A city that is a prime target for Team Yami's goal Timeless Ruins (Purple Dot) An old destroyed castle that seems to slow down time in the area, could it be a Pokémon? Maelstrom Cave (Yellow Dot) A cave that is sometimes visited by Kyogre and Groudon The Badlands (Red Dot) A desert that constantly has strong sandstorms. Team Yami's base is located here Tamara Pokémon League (Red Square) No comment necessary In the region of Tamara, Pokémon and their trainers lived in perfect harmony together. There was nothing that was bad enough to disturb the peace, until a bunch of very shady individuals called Team Yami formed. They were a bunch of power-hungry beings that wish to rule the region. Their leader, Quirinus, wishes to figure out how to control the power of Primal Evolution in legendary Pokémon, and use them to inflict fear into civilians until they submit to Team Yami. In response, the Tamara region's Champion, Jynn, assembles a group of powerful Pokémon trainers called Team Valor. Team Valor's goal is to drive Team Yami out of the region. Currently, Jynn has called for a meeting with new recruits in Traverse City, while Quirinus is back in his secret base at the Badlands, discussing his own plans to his grunts. Jynn Venas & Utopia Jynn and Utopia entered the room they planned to meet the new recruits of Team Valor. Jynn looks around. He is quite nervous about how the new members will perceive his intentions. Utopia quickly notices his friend's reluctance. "You seem..... stressed. Is everything alright?" Jynn looks back at him. He puts his hands in his pockets to keep himself relaxed. "I'm just nervous. There have been many "teams" these last couple of decades that have never had good intentions. 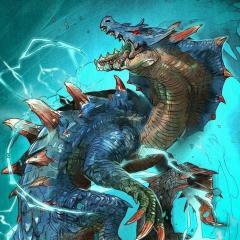 I'm just hope people won't believe that this is a destructive alliance." Jynn then begins to pace around the room. Utopia sighs in agreement. "I understand. But all is said and done. You made this alliance, I strongly believe you should try to accomplish its goal; to drive out the dreadful Team Yami from the region. You must remember that you are doing this for all the innocent people that live here, not for reputation." Jynn looks back with a smile. Utopia then asks, "What do you think we should do after this nonsense is over?" Jynn merely shrugs. "I'm not sure. You have an idea?" The Lucario nods. "What if we drop our mantle as Champions? Imagine, spending a couple of months at Alola. Warm sandy beaches, magnificent views, new trainers to battle, the new Pokémon League. What do you think?" Jynn likes the way Utopia is thinking. It has been a while since he went on an adventure. But, he remembers the duty of a Champion. "I love that idea, and we can totally do that, but in order to retire from being Champions, we need to be defeated first." Utopia sits down in annoyance. "True.........." Ever since the two became Champions, nobody has ever defeated them. Jynn was growing tired of defending his title, and was itching for someone to beat him. He then thinks of something. "If only we could lead a trainer on the right path......."
Which Kingdom Hearts game do you want a current-gen remake of? 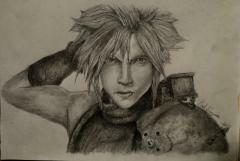 Drawing of Cloud as he appears in the latest Final Fantasy VII Remake trailer. Made a roleplay similar to this one a long time ago and it didn't end all that well. Hoping this one will do better since im more active now. (: The Story Organization XIII has always strived to achieve their goal in getting Kingdom Hearts. Reality hit, when The Organization started to realize their goals were farther than they anticipated. Hope was lost. The world(s) around them were also coming to an end. Darkness was everywhere, everything was abandoned. The once notorious Organization XIII was nothing more than 3 members. Number I Xemnas, Number VIII Axel, and Number IX Demyx, and they had been locked away in The Castle That Never Was. Facing the reality that hope was no longer with them wasn't the only thing the organization faced anymore. In Castle Oblivion, a new unknown source of activity seemed to be growing. A new group full of darkness emerged under the shadows, it resembled Org. 13. They called the group Incarceron. To Xemnas this knew strange activity served as a potential threat to the goal that seemed to have been long forgotten. The possibility of losing Kingdom Hearts gave Xemnas the drive to gather new members. He would find out everything he needed to know about this strange and unfamiliar group. He would do this even if it meant that he would loose Kingdom Hearts in the process. He wanted to destroy Incarceron. Meanwhile Castle Oblivion beamed with activity. Its leader was building the group with the help of the darkness. Who were these new people? They claimed Castle Oblivion as their own. They started to take over the darkness. What could they possibly want? Was it Kindgom Hearts they were after? Only the leader, Moonlight Takeharu had the answers, and Xemnas wanted them. Both groups want to achieve the same goals. Who will achieve it first? Who will lose? Sign Ups if you would like you can have up to 2 characters. One character can side with Org. 13 and the other with Incarceron. BOTH OF YOUR CHARACTERS CANNOT BE ON THE SAME SIDE. Please Make it an even number guys! You cannot use any of the original Organization XIII characters. Name: Age: Appearance: Group(Incarceron/ORG. 13): Keyblade Weilder(Yes/No): Weapon(s): (you can have up to 2 if you like) Special Abilities: (you can only have up to 2 if you wish.) Personality: Background: MY CHARACTER Name: Moonlight Takeharu Age: 19 Appearance: Group: Incarceron Keyblade Weilder: Yes Weapon(s): Chaos Ripper and Xigbars Lances Special Abilities: Can control Xigbars Lances and can create monsters through the darkness. Personality: Reserved, determined, and occasionally short tempered. Background: Grew into the darkness that she eventually became so consumed that she killed her own family, she couldn't bring herself to harm her younger brother so left him all alone. Shes been wanted all her life for crimes. She found the group Incarceron for her own reasons to achieve Kingdom Hearts. She will do anything to achieve this goal. RULES Follow all the rules that have already been set in place. Please do not kill another member's character. Please Post at least 5 sentences in each post of the roleplay. Please stay commited! (Post "I will stay commited!" at the end of your post so I know.) Have fun. I think that's all if you have any questions message me! Okay, today I'll be talking about why I think an FF7 remake is still very possible. You remember what Square Enix did at PS Experience? Now it may have seemed like they were trolling us, but... What if this is just a "testing their waters" move? Maybe they just wanna see if there is still genuine interest in FF7. However, I don't think this port alone would be enough to convince them. I also think FFXV needs to do well. Remember when they said in order to remake FF7, they first need to make an FF that surpasses it in quality? Well, that's a tall order. Anyway, what if FFXV DOES surpass FF7 in the fan base's opinion? Does that mean we'll get an FF7 remake? Well, it seems possible. FFXV is likely to release in 2016, just one year after that will be FF7's 20th anniversary. So, if this port of FF7 sells well, and FFXV surpasses FF7, then an FF7 remake might happen? It would certainly be good way to celebrate the 20th anniversary, and SE would be swimming in cash. It might be wishful thinking, but I think SE might be saving the FF7 remake announcement for the game's 20th anniversary. What are your thoughts?